Gruene, Gruene, it's Gruene they say . . . I think that play on the New Christy Minstrels' song is about the only play on words left unmade, in reference to that little suburb of New Braunfels - there is the Gruene Leaf, the Gruene Door, the Tavern on the Gruene and so forth. Which is not bad for a pretty little neighborhood, perched on the bluffs overlooking the Guadalupe River; it might almost be preserved in amber. 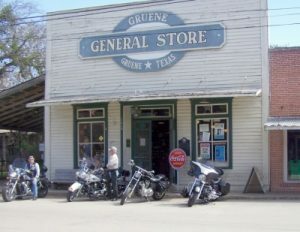 Gruene was first settled by German immigrants, who are ubiquitous in this part of Texas. They were moving out from an already well well-settled New Braunfels. 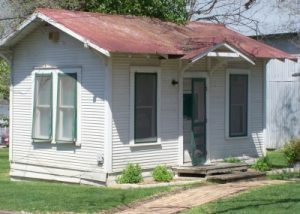 Astonishingly, Gruene was a center of cotton production until local cotton crops were destroyed by the boll weevil and the cotton gin buildings burned down. The neighborhood gently decayed for a number of decades. In the 1970s, it barely escaped being demolished to build a high-end development; fortunately, saner (and more historically-oriented) heads prevailed. It still is one of those semi-obscure yet charming places that you wouldn't really know about, unless someone took you there, or you went to eat at the Gristmill Restaurant, went tubing on the river, or to a concert and dance at the Gruene Hall, billed as the oldest existing dance hall in Texas. There a handful of shops - selling a variety of antiques, crafts, garden items, sporting goods and Texas edibles, such as jelly-beans the size of cocktail weenies (yes, everything is bigger in Texas!) 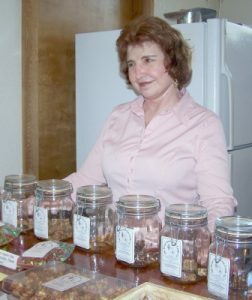 and the Great Texas Pecan Candy Company, which had pecan brittle and sweets which were so deliciously fragrant that they could be smelled all the way out to the sidewalk on Hunter Road. 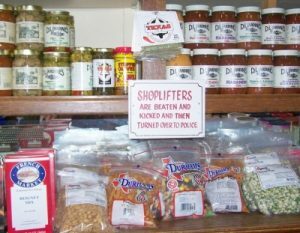 There was more candy and food, along with books and other souvenirs at the Gruene General Store. 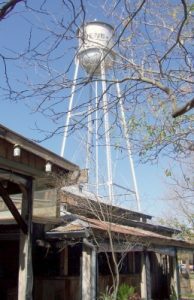 Most of Gruene itself is anchored by the Gristmill River Restaurant and Bar - this is a rambling establishment built up, in and around the remnants of the old cotton gin boiler house. Several levels of terrace overlook the river below, and the bar spreads out onto picnic tables in a grove of trees. There is no better place I can think of for miles, to sit back on a fine, mild afternoon and enjoy. 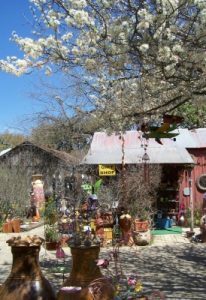 Many of those buildings which now house the various commercial establishments in Gruene are recycled from what they were before (generally houses of varying degrees of size and splendor) but the Buck Pottery was a turn of the last-century barn. 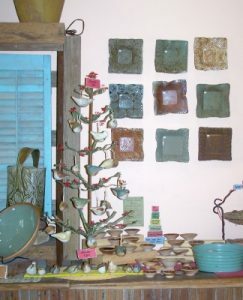 It is now outfitted as a workroom and show-place for hand-made pottery, items both useful and ornamental. (And a bit on the pricy side, I might add, somewhat wistfully.) But one of the tiniest building existent was the mill-owner's office; hardly the size of a back-yard playhouse. I don't know what it is used for today - it's one of the buildings still in private use in Gruene. 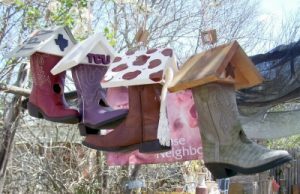 Gruene is about twenty minutes drive from Northside San Antonio. Take the 191 exit on IH-35 and go west to Hunter Road, then turn left and go another half mile. If you pass the water tower, and go down the hill to the bridge over the river, you've missed it.